My experience with mini-whip type antennas has not been good, but that's because this area has a high noise level. This type of antenna is very good for its small size and excellent performance at LF, but it is wide open to local electrical noise. In contrast, my Wellbrook loop reduces the noise from around S9 to S1 and reception is clear as a bell. So I'm using the mini-whip as a 'noise antenna' for my QRM eliminator. It works really well! Went back to my original setup for reference ,8mhz and 14mhz dipole (V for 14mhz and inverted V for 8mhz)with 1:1 balun and a MFJ-945D mobile tuner. And this of course allows me to cover all HF freqs very well and not surprisingly better than this mini-whip. Will experiment a little more with my setup (mini-whip) and see if i can improve performance.grounding, height, earthing..e.t.c. With this mini-whip presently 4.5v works quite well for me (3m above ground) ,Certainly not perfect but quite good. Technically circuit wise i am not currently that knowledgeable enough to modify it. I strongly agree the noise problem you described. I have to say something so I just register to this forum. I recently bought exactly the same antenna with isolation transformer and couldn't wait to try it because I read on the internet the performance of "mini-whip" is so great. However, after hours of listening, moving around, and comparison to a ugly loop antenna, I was deeply disappointed: the noise level is very high and SNR is much lower than the loop antenna, more importantly, it causes many fake signals in LF and MF bands. I couldn't believe the results since "mini-whip" is highly rated all over the internet. I started to think my possible faults: grounding, location, common noise path, etc. I move the isolation box outdoor, next to the antenna and used a battery to power it, the noise became less, but still much higher than the loop. After I connect a short (buried into earth) ground to the antenna, the antenna became quieter, but it overloaded the receiver. More fake stations came all over the lower bands. Attenuation on receiver didn't help. 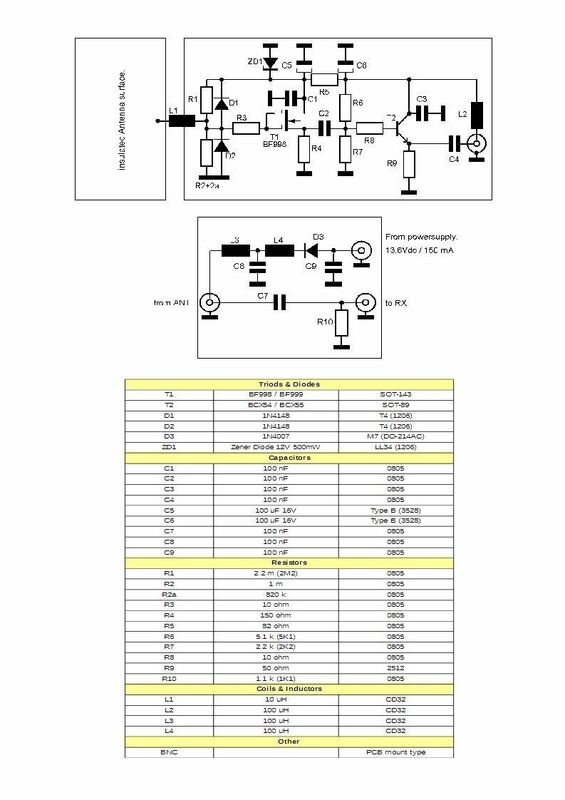 *This design uses high gain stage as first stage, the schematic note claims 20dB gain; This is why I saw so much overloading. *First stage is not a source follower, it's a common source amplifier instead. This change disregards the intermodulation requirement, which I think is most important thing in wide band active antenna design. Surprised. My opinion is modern receivers and portable radios usually have enough sensitivity. It doesn't make sense to insert 20dB RF gain by sacrificing intermodulation performance, especially in wide band antenna design. The circuit uses a BF998 dual-gate FET, I couldn't modify it to match PA0RDT design. To make it close to PA0RDT design idea, I tied the 2nd gate to supply, biased 1st gate like in PA0RDT design and moved the 200ohm resistor from drain to source and rewire the bipolar transistor base to the source also. Then I tested it again. LF and MF still have very strong signals, so the original 20dB gain seems unnecessary. The fake signals seem less. For receiving 10MHz and 15MHz WWV stations, the antenna can finally match my ugly loop antenna. But it cannot give as clear output as the loop at ~27MHz. In short, my opinion is the noise and intermodulation come from design flaws. Last edited by swlertx on Thu Jan 01, 1970 12:00 am, edited 0 times in total. swlertx wrote: I strongly agree the noise problem you described. I have to say something so I just register to this forum. Thanks for posting this, I was looking at getting the same antenna and shared the same gain, noise and grounding concerns. Sadly, he doesn't sell the PCB anymore. Last edited by Strykar on Thu Jan 01, 1970 12:00 am, edited 0 times in total. It is not my intention to blame something or someone. But I would neither recommend to use dual gate Mosfet nor to apply extra amplification in an active whip antenna. I know that dual gate Mosfets were the absolute must in the 80s of the last century and were often used in RF amplifiers and active antennas. I also have built such devices and had to learn that dual gate Mosfets have a poor IMD performance and in some cases high noise on lower frequencies. The J310/U310 that PA0RDT uses is the better choice, but even this suffers from IMD when the bias of the gate is not fine adjusted for best IMD performance. Variations of the antenna use an active current sink (constant current source) in the source section of the JFet or even push/pull designs with complementary JFets (which are hard to get nowadays) to improve the IMD situation even more. I cannot say if all problems reported with the antenna here are related to the Mosfet. But generally I think a Mosfet is not a good choice for this type of antenna when you want to have best results. Mini whips and kits are sometimes offered at ebay. If you do not want to make PCBs yourself this could be a good start. As an absolute know-nothing and incompetent diy numpty, who has just taken delivery of one of these - to hopefully complement my 20M longwire & H/V/Uhf discone (that's turned out better than expected). I'll wait and see how I get on with this mini-whip, but I did find this on youtube which may or may not prove useful to you. Sorry, but modifications of the bias T do not compensate the design of all the rest. Chris Trask (among others) has built several whip amplifiers and recommends (among other designs) an input stage which has an active current sink as a load resistor. Here is a practical solution from DL4ZAO which is inspired by Chris Trask's proposal and adds some useful parts. The most important one is a stabilized, adjustable gate bias for the J310 which should be set for best IMD with a two tone generator. One can easily see that a good whip amplifier needs some more parts than a Mosfet and and a single output stage. This design avoids a complementary input stage with a J310 plus a J174, J270 or even J271. Parts which are very difficult to get on the market. It uses two J310 which are still in production. - New version, using modern BF998 and BCX54 semi conductors. - Real class A circuitry, clean reception without IMD. - Broadband R/C coupling to the receiver, no transformer. The ra0sms mini whip antenna requires a 12-15V 100-150ma power supply. Around the house, I have many power supplies that are labeled as 12-15V and 100-150ma but when measured, are nowhere near the printed output. All are over voltage and current. Not one was true to the label. Not one was under voltage or current. An Archer Universal Adapter that goes from 3-12V in 6 steps is actually 3 (5.2V), 4.5 (6.9V), 6 (8.8V), 7.5 (10.6V), 9 (12.6V) and 12 (16V). With that said, where can I find a true 12V 100mA power supply? Last edited by ultravista on Thu Jan 01, 1970 12:00 am, edited 0 times in total. Strykar wrote: @Heinrich Opinions on this design? The antenna will certainly work. But as I said I would not trust the a BF998 or other dual gate. Better use a J310 and an old BG591 or BFU590 or a good original 2N5109. Stabilise the bias voltage for the J310 with a voltage regulator and make it adjustable for best IMD.